Christmas is the most wonderful time of the year, but it’s also one of the most stressful. While your cat might not have any presents to buy or food to prepare, there are still factors that can contribute to an altogether stressful time. Whether your cat lives exclusively indoors or comes and goes as he pleases, it’s likely that the Christmas period will interfere with his routine and cause a degree of anxiety. As the weather turns, you may find your outdoor cat suddenly spending more time inside, which means he’ll be more affected by the festive upheaval. If you don’t already have one, create a ‘safe space’ or retreat for your cat for when things get too much. If you have guests, make sure there is somewhere only your cat can access, such as a bed placed high up or a separate room out of bounds to visitors. Remind yourself of the foods that are toxic to pets that tend to make an appearance at Christmas. Grapes and raisins, nuts, chocolate, nutmeg, onions and garlic and sweeteners like Xylitol are all poisonous to cats and dogs to some extent and should be avoided as much as possible. For more information on toxic festive foods, have a read of our blog. Try and keep the routine as normal as possible, including feeding times and any other activities that are done regularly and at a specific time. If your cat is let out in the mornings, try to remember to do this as you would ordinarily. Keep stocked up on your cat’s regular food and medication so you don’t run out over the Christmas period. Having to source a different food or reduce your cat’s medication will increase stress considerably, both for you and your cat. Even if you’re busy, make time to groom and play with your cat. Keeping him entertained will help distract him from any other stressors in the home and keep him stimulated throughout the day. Interactive toys can be particularly useful when you’re busy and time is short, as these keep your pet engaged without any effort from you. 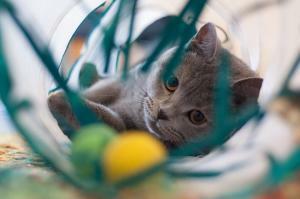 Buy a calming product or supplement such as Feliway, which is available as a diffuser or spray. Feliway contains a synthetic copy of the ‘feline facial pheromone’ or ‘happy marker’ that cats leave behind when they rub their faces on people, furniture, doorways and other objects in the home. SettleMe is our own brand calming supplement, which contains a blend of ingredients believed to help support calm behaviour and reduce anxiety, stress-related behaviours and over-activity, and can be used alongside Feliway/other pheromone/herbal products. It's also designed to be palatable, for easy feeding to fussy cats. If you have any other tips on helping your pets cope with Christmas, please comment below and share with our other readers! Please also remember that Ponsettia is highly toxic and fatal to cats.